Happy New Year 2011. What could be the better way to celebrate the New year than starting the first thrusday of the year in the presence of the Parabrahma Shri Sai and our Sadguru Sai Veena Maa who guides & shows us the Parabrahma. I started my journey of reciting the Sacred script Shri Sai Amritvani around 3 years ago when the holy couple made their first presence in Hyderabad. Since then i never missed an opportunity to attend the Amritvani whenever they have been to Hyderabad. Even otherwise, Baba has filled in a lot of enthu in me to recite the sacred script, Shri Amritvani every thursday with out fail since 3 years. This unique divine quality was rooted and imbibed in me by Veena ma. I consider her as my first guru. She has touched my life and transformed me immensely.Thaanks maa. Wherever i refer to veena ma it could be Baba and wherever Baba is refered it could be Veena ma. I see no difference in them. Baba uses Veena ma as his medium to transform tremendous power & enery to the devotees. Mrs. Vaneja aunty requested Veenama to come to Hyderabad from Bangalore to bless the devotees of Hyderabad. This thursday as soon as i visited Mrs.Vaneja aunty's house, may Sai bless her & her family for having invited Veenama to shower her blessings, i started feeling a kind of chilled vibrations from the spine raising towards my head. And this feeling continued through out the Amrithvani. Probably this is the kundalini Shakthi that i read in meditation books. I know, my thanks wont be enough to express my gratitude to Baba and the holy couple.Still, Thank you Veena ma and Ashokji. This week,Veenama stressed the importance of Meditation to recieve Sai's power & grace. In her words... Everyday a minimum of 5 minutes should be spent in meditation after praying Sai. Keep your mind & heart calm, do not allow your mind & heart to wander here and there. Recite Sai Sai if it wanders, this will allow your mind to be thoughts free, calm, concentrated & composed. Devotees should close their eyes for a 2 minute meditation after the Amritvani and should not open until Veenama completes a powerful prayer to Sai on behalf of All. Only after her prayers...everyone should open their eyes because she is praying for all of us and this prayer is extremely powerful and we should concentrate on this powerful prayer. Then we saw Baba's Leelas which are captured in the pictures i have taken in my mobile.Sorry for the bad clarity of these pictures. 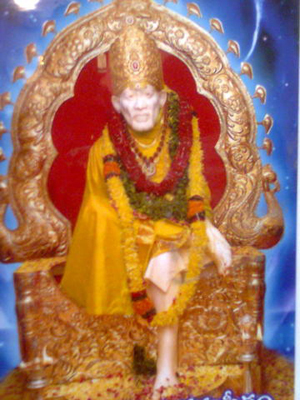 One of the devotees brought Baba's murthy which is very big in length. Veenamaa's request to devotees is that we should not have a murthy (idol) which is bigger than the size of our palm. Such big size are meant to be in temples only. If we are keeping murthy of this size in house...then its such that we should daily do the 4 aarthis, offer bhog four times and do the abishek regularly as in temples. Since it would not be possible for everyone, we should restrict the idol to the size of the palm at the max. This idol which the devotee brought shows Baba cooking in a big handi. Vibhuti manifested on it And Baba did not leave it there, he is the amazing creator of this universe, he has shown his creativity by cooking some sweet dish in the handi. Can be seen in the pic.Such is the wonderful power of baba. Devotees also prayed for the doctor family, Rajesh Talwarji and Nupur Talwarji for the injustice done by the CBI in the case of their Late daughter Arushi's murder. May Baba remove all their troubles. The email has become too lengthy...again this flow is not mine but Baba's. Thanks to Veenama, Ashokji. Thanks to Mrs. Vaneja & family. May Baba fulfil all their desires. Lets pray Baba to continue to shower his blessings through Veenamaa, i'm sure if Baba wishes, Maa will visit Hyderabad often though her son got transferred to Bangalore & resides there. Hail to Shri Sai. Peace be to All.